Killer Characters: Cookies are Food, Too. Right? Cookies are Food, Too. Right? by Maddie Briggs, Olivia Greyson’s intrepid sidekick in THE COOKIE CUTTER SHOP MYSTERIES, by Virginia Lowell. Let me say right up front that I, Maddie Briggs, adore decorated cookies. Any type of cookie, in fact. I love creating them, and I love devouring them. Right now I’m icing a batch of cutout cookies to put out for customers. So don’t start thinking I’ve turned into a health food nut. Not that I’m against healthy food. I love all food types, I really do. I was born to cook. And eat. That being said, I’m a tad concerned about Olivia’s eating habits, and I’m not talking about cookies. I’m Livie’s best friend and business partner. 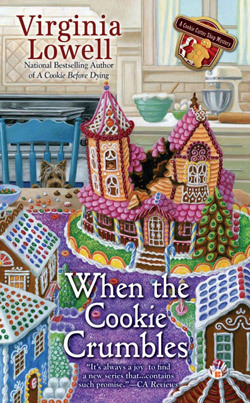 Together we run The Gingerbread House, a glorious little store specializing in anything remotely related to cookies. It’s a dream come true. Excuse me a second. I need to fire up the mixer. Okay, back to Livie. Here’s her diet: Pizza, coffee, merlot, and leftovers—the latter being mostly cold pizza. Even when Sheriff Del Jenkins takes her out for a meal, Livie scans the menu for pizza. Yesterday they had breakfast at the Chatterley Café. Livie ordered scrambled eggs with pepperoni. That’s just sad. Although it does sound tasty. The point is, Livie and I have been best friends since age ten, and I worry. So as soon as she pokes her head into the kitchen, I’ll delicately introduce the varied-diet concept. Wait, what am I thinking?! Livie is a grown woman, smart and feisty. She knows her own mind. Who am I to criticize her eating habits? I consume more than my share of pizza. And to be honest, decorated cookies are my breakfast food of choice. They usually contain eggs, a significant source of protein, right? In fact, meringue powder, which we use in royal icing, is composed of dried egg whites. That’s a good thing, given I sometimes have decorated cookies for lunch, too… and occasionally dinner. Yet I am, as Livie puts it, a bundle of unstoppable energy. So I’m wondering, might decorated cookies actually help, rather than hinder, our investigative pursuits? I do feel energized by the cookie baking and decorating. Or is that a sugar high? Feel free to weigh in with your thoughts, even if you think both Livie and I should cut back our cookie consumption a bit. I can take it. Although I might need a cookie for comfort. Just a little one…. Maddie: I think asking you to cut back on cookies would be like asking me to cut back on books. Way too depressing to contemplate. Oh I ENVY you your ability to eat cookies for breakfast and lunch - especially with a nice cup of tea - but I think I might get a touch weary of them... maybe a salad now and then?? LOL!!! Or maybe a cookie with a nice lettuce-green icing... perhaps some tomato-red sprinkles on top? I hear you. Cookies, clothes, it's a tough choice. I have been trying to cut back on sweets and it isn't easy. I love my cup of tea and cookies. That cup of tea isn't quite the same without a cookie, is it? I've tried substituting with a nap, but all I do is dream of cookies. Cookies help everything!!! Thinking and investigating. Go for it! Oh,thank you!! I think so, too. My motto is: Life is short, eat a cookie! Lol, I think you are running on a sugar high, and I think if you also eat pizza, you get your veggies that way. But for Maddie, is there no Chinese restaurant or something around the corner, so she can change her diet at least a little bit without having to cook her own dinner? I always say, a sugar high is the only way to run. And you're right--vegetables taste better when they are on top of a pizza! However, a Chinese restaurant is a good idea. Perhaps one will appear soon... you never know.